Wind Cave South Dakota lies between Custer and Hot Springs. The site was the first cave to receive designation as a national park. The park consists of pine forest hills, large rock formations, rivers and the largest existing natural grassland in the US. Hundreds of thousands visit annually to enjoy the cave, picturesque scenery and wildlife. The equalization of atmospheric pressure causes air to enter or exit the cave. At times, individuals hear the effects of this occurrence. History reports that air currents were strong enough to remove the hat from an explorer’s head on two separate occasions, thus the cave was named. Though discovered by two brothers in the late 1800’s, the Lakota people consider the Wind Cave sacred and knew of the cave’s existence for centuries. Thought to be the fourth longest cave in the world, the caverns stretch over 130 miles in length. However unusually, the entire cave encompasses an area of approximately one square mile. The densely mazed cave contains passageways weaving up and down, back and forth, reaching deep within the earth’s surface. Researchers discover miles of new passageways annually. The estimated 300 million year old cave lacks commonly seen stalagmite and stalactite formations. Nevertheless, the caverns house many remarkable and rare structures including boxwork, frostwork and helictite bushes. Boxwork consists of lacy, spider web like calcite deposits. How they form is still largely unknown. Frostwork appears as fine needle like protrusions on various other formations. Helictite bushes look similar to gnarled, twisted tree branches and grow quite large. Visitors exploring the caverns also see remnants of cave drawings, created by the ancient peoples who took refuge within the chambers. Guests may participate in any one of six separate tours the visitor center offers. Each tour requires a different level of physical activity. Tours range from easy to strenuous and last anywhere from little over an hour to four hours in length. 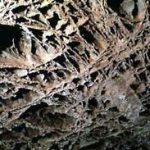 Visitors have the option of embarking on tours exploring the most commonly seen areas of the cave, or venture on candlelight and wild tours that allow smaller groups to investigate rarely seen and unlit passageways. A special needs tour is available that ensures wheelchair accessibility. Campground stays and cave tours are the only locations in the park requiring a fee. Wind Cave National Park encompasses over 28,000 acres of varying landscape. Several roads enter and exit the area, which contains over 30 miles of hiking trails. The campground, located 1.25 miles from the visitor center, operates on a first come, first serve basis and welcomes tents or Rvs, but has no electrical hookups or dump stations. Flushing toilets and running water is available for guests, but there are no showers. The destination allows backcountry camping after persons obtain a free permit from the visitor’s office. Wind Cave National Park is a reserve protecting numerous animal and plant species including a herd of disease free, free roaming, and genetically pure bison. The location also contains elk, ferrets, prairie dogs, pronghorn sheep, amphibians, reptiles and dozens of migratory and native bird species. Individuals traveling on foot are advised to be wary of the bison population and rattlesnakes. Park rangers offer various scheduled presentations and tours concerning the area history, the cave, local geology, the plant and animal wildlife. Guests learn various facts about the native wildlife including the specific species, adaptation, survival skills and the physical ability of various animals. Night presentations offer visitors the opportunity to learn navigation skills using various constellations. Evidence proves indigenous peoples inhabited the area for thousands of years, residing on the plains and within the depths of the cave. Scientists have also discovered fossils dating back 30 million years. The prehistoric skeletons of deer like creatures, horses, mesohippus, and a hornless rhinoceros are on display at the Mammoth Site in Hot Springs. Enumerated maps and age descriptions are available at http:.//www.nps.gov/wica/nature science/geologic formations.htm. for those interested in exploring the geological formations of the area, some of which are believed to be one billion years old.